Orange sign with a notice of eviction written upon it. 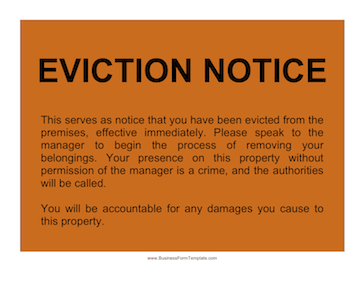 Text: This serves as notice that you have been evicted from the premises, effective immediately. Please speak to the manager to begin the process of removing your belongings. Your presence on this property without permission of the manager is a crime, and the authorities will be called. You will be accountable for any damages you cause to this property.